This article is about the Iranian revolution of 1905–1911. For the revolution that took in 1979, see Iranian Revolution. For the series of reforms launched in 1963, see White Revolution. The Persian Constitutional Revolution (Persian: مشروطیت‎ Mashrūtiyyat, or انقلاب مشروطه Enghelāb-e Mashrūteh), also known as the Constitutional Revolution of Iran, took place between 1905 and 1911. The revolution led to the establishment of a parliament in Persia (Iran) during the Qajar dynasty. 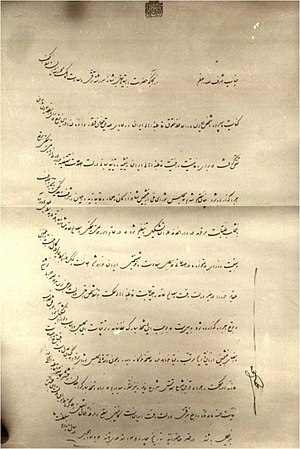 The royal proclamation of Mozaffar ad-Din Shah that agree the Constitutional monarchy on August 5, 1906. The Revolution opened the way for cataclysmic change in Persia, heralding the modern era. It saw a period of unprecedented debate in a burgeoning press. The revolution created new opportunities and opened up seemingly boundless possibilities for Persia’s future. Many different groups fought to shape the course of the Revolution, and all sections of society were ultimately to be in some way changed by it. The old order, which King Nassereddin Shah Qajar had struggled for so long to sustain, finally died, to be replaced by new institutions, new forms of expression, and a new social and political order. The monarch Mozaffar ad-Din Shah Qajar signed the constitution in 1906, but he died shortly after and was replaced by Mohammad Ali Shah. The latter abolished the constitution and bombarded the parliament with Russian and British support in 1908. This led to another pro-constitutional movement. The constitutionalist forces marched to Tehran, forced Muhammad Ali Shah's abdication in favor of his young son Ahmad Shah Qajar and then re-established the constitution in 1909. The "1921 Persian Coup" (Persian: کودتای ۳ اسفند ۱۲۹۹) refers to several major events in Iran (Persia) in 1921, which eventually led to the establishment of the Pahlavi dynasty as the ruling house of the country in 1925. On December 12, 1925, Iran's parliament amended Iran's constitution of 1906–1907 to replace the Qajar dynasty (1797–1925) with the Pahlavi dynasty as the legitimate sovereigns of Iran. The movement did not end with the Revolution being put down in 1911 by the Russians, but was followed by the Jungle Movement of Gilan (1914-1921). With the first provision (the fundamental law) signed by Muzzafir al-Din just days before his death, Iran saw legislative reform vital to their goal of independence from British and Russian imperialism. The three main groups of the coalition seeking a constitution were the bazaar merchants, ulama, and a small faction of radical reformers. These groups shared the goal of ending royal corruption and stopping the dominance of foreign powers. Revolutionaries argued that role of the shah was once again being used to keep the Shah, Qajar, and the other aristocrats wealthy at the expense of surrendering the country's resources and economy. They argued that whilst Iran's oil industry was sold to the British, tax advantages on import/export and manufactured textiles destroyed Iran's economy formerly supported by bazaar merchants. Muzzafir al-Din accumulated a fortune in foreign debt while selling off assets to repay the interest, instead of investing in Iran. This rift founded Iran's constitutional revolt. The fundamental law gave the elected legislature a final approval over all loans, concession, and budget. Further power was diverted from the shah with the supplementary fundamental law passed a few days later giving power over appointing ministers, and later a committee of mujtahids was introduced to confirm new laws abide by the shari'ah. Despite the ulama's best efforts towards independence from external dominance, in 1907 Britain and Russia capitalized on Iran's weak government and signed the entente which divided Iran among the two leaving a neutral zone in the center of the country. The end of this constitutional period came when members of the Majlis in the remaining neutral zone of Tehran dissolved under the issue of equal rights for non-Muslims, Russia then invaded Tehran and captured the city. While Iran did gain a constitution, the goal of Iranian independence was not achieved by the revolts. Weakness and extravagance continued during the brief reign of Mozaffar ad-Din Shah Qajar (1896–1907). He often relied on his chancellor to manage his decentralized state. His dire financial situation caused him to sign many concessions to foreign powers, on an expanding list of trade items ranging from weapons to tobacco. The established noble classes, religious authorities, and educated elite began to demand a curb on royal authority and the establishment of the rule of law as their concern over foreign, and especially Russian, influence grew. He had also taken out several major loans from Russia and Britain to pay for his extravagant lifestyle and the costs of the central government. In 1900 the Shah financed a royal tour of Europe by borrowing 22 million rubles from Russia. Iranian customs receipts served as collateral. Members of the First Majlis (October 7, 1906 — June 23, 1908). The central photograph is that of Mortezā Qoli Khan Sani od-Dauleh, the first Chairman of the First Majlis. He had been the Finance Minister for seven months when he was assassinated on 6 February 1911 by two Georgian nationals in Tehran. In 1905 protests broke out over the collection of Persia tariffs to pay back the Russian loan for Mozaffar ad-Din Shah's royal tour. In December 1905, two Persian merchants were punished in Tehran for charging exorbitant prices. They were bastinadoed (a humiliating and very painful punishment where the soles of one's feet are caned) in public. An uprising of the merchant class in Tehran ensued, with merchants closing the bazaar. The clergy following suit as a result of the alliance formed in the 1892 Tobacco Rebellion. The two protesting groups sought sanctuary in a mosque in Tehran, but the government violated this sanctuary and entered the mosque and dispersed the group. This violation of the sanctity of the mosque created an even larger movement which sought refuge in a shrine outside Tehran. On January 12, 1906 the Shah capitulated to the demonstrators agreeing to dismiss his prime minister and to surrender power to a new "house of justice," (the forerunner to the parliament). The Basti (protesters who take sanctuary in mosques) returned from the mosque in triumph, riding royal carriages and being hailed by a jubilant crowd. In a scuffle in early 1906 the Government killed a seyyed (descendant of the prophet Muhhamed). A more deadly skirmish followed a short time later when Cossacks killed 22 protesters and injured 100. Bazaar again closed and the Ulama went on strike, a large number of them taking sanctuary in the holy city Qom. Many merchants went to the British embassy which agreed to offer protection to Basti in the grounds of their legation. In the summer of 1906 approximately 12,000 men camped out in the gardens of the British Embassy. Many gave speeches, many more listened, in what has been called a `vast open-air school of political science` studying constitutionalism. It is here that the demand for a majles (parliament; also means gathering in Persian; pronounced "Madj-less") was born, the goal of which was to limit the power of the Shah. In August 1906, Mozaffar ad-Din Shah agreed to allow a parliament, and in the fall, the first elections were held. In all, 156 members were elected, with an overwhelming majority coming from Tehran and the merchant class. October 1906 marked the first meeting of the majles, who immediately gave themselves the right to make a constitution, thereby becoming a Constitutional Assembly. The Shah was getting old and sick, and attending the inauguration of the parliament was one of his last acts as king. Mozaffar ad-Din Shah's son Muhammad Ali, however, was not privy to constitutionalism. Therefore, they had to work fast, and by December 31, 1906 the Shah signed the constitution, modeled primarily from the Belgian Constitution. The Shah was from there on "under the rule of law, and the crown became a divine gift given to the Shah by the people." Mozaffar ad-Din Shah died five days later. One of many series of execution of "Constitutional Activists" by Russian cossacks in Tabriz. Within the decade following the establishment of the new Majles a number of critical events took place. Many of these events can be viewed as a continuation of the struggle between the constitutionalists and the Shahs of Persia, many of whom were backed by foreign powers against the Majles. The following January Shah Muhammad Ali, the 6th Qajar Shah, came to power. In August 1907, an Anglo-Russian agreement divided Iran into a Russian zone in the North and a British zone in the South, with a neutral band in-between. The British switched their support to the Shah, abandoning the Constitutionalists. In 1908, the Shah moved to "exploit the divisions within the ranks of the reformers" and eliminate the Majles. Persia tried to keep free from Russian influence through resistance via the Majles to the Shah's policies. The Majles employed the American Morgan Shuster to reform the tax system and the treasury. Russia issued an ultimatum to expel Morgan Shuster and to close the Parliament. Russia invaded the North West and North of Iran to protest against the continued employment of Morgan Shuster. Commemorative poster (3 x 4 m2) pertaining to the conquest of Tehran by the Constitutional Revolutionaries in July 1909. The two men on horse are Mohammad Vali Khan Tonekaboni (Sepahsālār-e A'zam-e Tankāboni), and Sardar Asad. Mirza Nasrullah Khan – First Elected Prime Minister of Iran. Mirza Jahangir Khan – Founder and Editor of the Sur-e Esrafil newspaper. Mirza Aqa Khan Kermani – writer, an Iranian literary critic and founder of new Iranian nationalism. Sayyid hossein Ardabili – Member of Demokrat party in Tehran and Mashhad. Sattar Khan – One of the main leaders of the revolutionary movement (Sardār-e Melli, meaning National Commander). Haj Baba Khan-e- Ardabili – Hero of Iranian Constitutional Revolution in Tehran, Tabriz and Ardabil. Mirza Kuchak Khan – Founder of a revolutionary movement based in the forests of Gilan. Khetcho – Armenian revolutionary leader. Wounded in battle in 1910. Yeprem Khan – Armenian Iranian revolutionary leader. Wounded Sattar Khan in the course of disarming the revolutionaries in Tehran as commander of Tehran's police force during the interim constitutionalist government. Arshak Gafavian – Armenian revolution leader. Killed the murderers of Yeprem Khan in revenge. Sardar Assad – Bakhtiari tribal leader whose forces captured Tehran in 1909 for the constitutional movement. Bibi Khatoon Astarabadi – Satirist, writer and one of the pioneers in Iranian women's movement. Amanollah Khan Zia' os-Soltan – aristocrat from the Qajar royal family and big landowner in Tabriz, who was for democratic reforms and modernization. He was accused of being responsible for the bomb assault against Mohammad Ali Shah, arrested at Bagh-e Shah and finally before his execution let free by British troops. Haj Seyyed Mohammad Sarraf – merchant and banker from the Alavi family of Tehran. One of the leaders of the Democratic Party. Deputee to the first Majles for the bankers of Tehran and deputee to the fourth Majles for the people of Tehran. His brother was Haj Seyyed Javad Khazaneh, treasurer of Mozaffar ad-Din Shah at the time of the constitutional revolution and his grandson was the famous writer Bozorg Alavi. Mirza Abdul'Rahim Talibov Tabrizi – Intellectual and social reformer. Sepahsalar Tonekaboni – Leader of the constitutionalists revolutionary forces from the northern provinces of Gilan and Mazandaran, was the first to arrive in Tehran and liberate the city from the Royalist forces and became the first leader of the constitutionalist government. Howard Baskerville – American teacher who fought alongside the Constitutionalists. Mohammad Ali Mahdavi – In remembrance of Mr. Howard Baskerville for giving his life during the Constitutional Revolution in Iran in 1909, Mr. Aref Ghazvini, one of Iran's highly regarded poets traveled to Tabriz to pay tribute to Baskerville in 1923. Mr. Ghazvini and a few of the revolutianaries held a special tribunal ceremony for Baskerville in Tabriz. In this ceremony Mr. Aref Ghazvini read a poem he had written about Baskerville. Later Mr. Mahdavi had this poem inscribed on a tabular tombstone which was placed on Baskerville’s resting place in Tabriz. Howard Baskerville was and still remains a beloved hero in Iran. There is a photo of Mr. Mohammad Ali Mahdavi with the inscribed tabular tombstone for Mr. Baskerville in a book written in Persian entitled, “Baskerville and the Iranian Constitution” authored by Mr. Ali Kamalvand, 1957. Mohammed Mosaddeq – Liberal Nationalist and future Prime Minister of Iran. Mozaffar ad-Din Shah Qajar – Shah of Persia who signed the constitution, thereby creating a constitutional monarchy. Mohammad Ali Shah – Son of Mozaffar ad-Din Shah. Attempted to crush the constitution. Sheikh Fazlollah Nuri – a cleric who backed the king and stood against the constitutional revolution. After the victory of the ICM he was hanged. Vladimir Liakhov – a Russian colonel and Commander of the Persian Cossack Brigade during the rule of Mohammad Ali Shah Qajar. He shelled and subsequently laid siege to the seat of the Majlis of Iran. Sayyed Jamal ad-Din Esfahani, constitutionalist. Malek al-Motakallemin, constitutionalist (see Mirza Jahangir Khan and Mohammad-Ali Jamalzadeh). Sayyed Abdullah Behbahani, constitutionalist (see Sayyed Hasan Taqizadeh). Mirza Sayyed Mohammad Tabatabai, constitutionalist. ^ a b c d e Abrahamian, Ervand (1982). Iran Between Two Revolutions. Princeton University Press. pp. 76–77. ISBN 0-691-10134-5. ^ a b c Abrahamian, Ervand (1982). Iran Between Two Revolutions. Princeton University Press. p. 83. ISBN 0-691-10134-5. ^ Abrahamian, Ervand (1982). Iran Between Two Revolutions. Princeton University Press. p. 81. ISBN 0-691-10134-5. ^ a b Abrahamian, Ervand (1982). Iran Between Two Revolutions. Princeton University Press. p. 84. ISBN 0-691-10134-5. ^ a b Abrahamian, Ervand (1982). Iran Between Two Revolutions. Princeton University Press. p. 97. ISBN 0-691-10134-5. ^ a b c Abrahamian, Ervand (1982). Iran Between Two Revolutions. Princeton University Press. p. 95. ISBN 0-691-10134-5. ^ Abrahamian, Ervand (1982). Iran Between Two Revolutions. Princeton University Press. p. 91. ISBN 0-691-10134-5. ^ Berberian, Houri (2001). Armenians and the Iranian Constitutional Revolution of 1905–1911. Westview Press. pp. 116–117. ISBN 978-0-8133-3817-0. ^ •	Tilmann J. Röder, The Separation of Powers: Historical and Comparative Perspectives, in: Rainer Grote and Tilmann J. Röder, Constitutionalism in Islamic Countries (Oxford University Press 2012), p. 321-372. The article includes scientific English translation of the following documents: The Fundamental Law (Qanun-e Asasi-e Mashruteh) of the Iranian Empire of 14th Dhu-‘l-Qa’dah 1324 (December 30, 1906); The Amendment of the Fundamental Law of the Iranian Empire of 29th Sha’ban 1325 (October 7, 1907). ^ a b Amanat 1992, pp. 163-176. ^ "CONSTITUTIONAL REVOLUTION". Encyclopaedia Iranica, Vol. VI, Fasc. 2. 1992. pp. 163–216. ^ "Pahlavi Dynasty - Dictionary definition of Pahlavi Dynasty - Encyclopedia.com: FREE online dictionary". ^ a b W. Morgan Shuster, The Strangling of Persia, 3rd printing (T. Fisher Unwin, London, 1913), pp. 48, 119, 179. According to Shuster (p. 48), "Five days later [measured from February 1st] the Persian Minister of Finance, Saniu'd-Dawleh was shot and killed in the streets of Teheran by two Georgians, who also succeeded in wounding four of the Persian police before they were captured. The Russian consular authorities promptly refused to allow these men to be tried by the Persian Government, and took them out of the country under Russian protection, claiming that they would be suitably punished." Mohammad-Reza Nazari. "The retreat by the Parliament in overseeing the financial matters is a retreat of democracy" (in Persian). Mardom-Salari, No. 1734, 20 Bahman 1386 AH (9 February 2008). Archived from the original on 27 April 2009. Amanat, Abbas (1992). "CONSTITUTIONAL REVOLUTION i. Intellectual background". Encyclopaedia Iranica, Vol. VI, Fasc. 2. pp. 163–176. Ahmad Kasravi, Tārikh-e Mashruteh-ye Iran (تاریخ مشروطهٔ ایران) (History of the Iranian Constitutional Revolution), in Persian, 951 p. (Negāh Publications, Tehran, 2003), ISBN 964-351-138-3. Note: This book is also available in two volumes, published by Amir Kabir Publications in 1984. Amir Kabir's 1961 edition is in one volume, 934 pages. Wikimedia Commons has media related to Constitutional Revolution, Iran. Reza Jamāli in conversation with Dr Abbās Amānat, Professor of History and International and Area Studies at University of Yale, in Persian, Radio Zamaneh, August 7, 2008 (Audio recording). Shokā Sahrāi, Photographs of the Constitutional Revolution of Iran, in Persian, Jadid Online, 2007. Slide Show, narrated by Dr Bāqer Āqeli, Jadid Online, 2007: (4 min 30 sec).